For other uses, see Tower of David (disambiguation). The Tower of David (Hebrew: מגדל דוד‎, Migdal David, Arabic: برج داود‎, Burj Daud), also known as the Jerusalem Citadel, is an ancient citadel located near the Jaffa Gate entrance to western edge of the Old City of Jerusalem. The citadel that stands today dates to the Mamluk and Ottoman periods. It was built on the site of a series of earlier ancient fortifications of the Hasmonean, Herodian-era, Byzantine and Early Muslim periods, after being destroyed repeatedly during the last decades of Crusader presence in the Holy Land by Ayyubid and Mamluk rulers. It contains important archaeological finds dating back over 2,000 years including a quarry dated to the First Temple period, and is a popular venue for benefit events, craft shows, concerts, and sound-and-light performances. Dan Bahat writes that the original three Hasmonean towers were altered by Herod, and that "The northeastern tower was replaced by a much larger, more massive tower, dubbed the "Tower of David" beginning in the 5th century C.E." The name "Tower of David" is due to Byzantine Christians who believed the site to be the palace of King David. 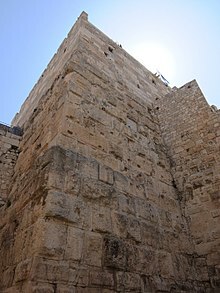 They borrowed the name "Tower of David" from the Song of Songs, attributed to Solomon, King David's son, who wrote: "Thy neck is like the Tower of David built with turrets, whereon there hang a thousand shields, all the armor of the mighty men." During the 2nd century BCE, the Old City of Jerusalem expanded further onto the so-called Western Hill. This 773-meter-high prominence, which comprises the modern Armenian and Jewish Quarters as well as Mount Zion, was bounded by steep valleys on all sides except for the northern one. The first settlement in this area was about 150 BCE around the time of the Hasmonean kings when what Josephus Flavius named the First Wall was constructed. Herod, who wrestled the power away from the Hasmonean dynasty, added three massive towers to the fortifications in 37–34 BCE. He built these at the vulnerable northwest corner of the Western Hill, where the Citadel is now located. His purpose was not only to defend the city, but to safeguard his own royal palace located nearby on Mount Zion. Herod named the tallest of the towers, 44 metres (144 ft) in height, the Phasael in memory of his brother who had committed suicide while in captivity. Another tower was called the Mariamne, named for his second wife whom he had executed and buried in a cave to the west of the tower. He named the third tower the Hippicus after one of his friends. Of the three towers, only the base of one of them survives until today—either the Phasael or, as argued by archaeologist Hillel Geva who excavated the Citadel, the Hippicus Tower. Of the original tower itself (now called the Tower of David), some sixteen courses of the original stone ashlars can still be seen rising from ground level, upon which were added smaller stones in a later period, which added significantly to its height. During the Jewish war with Rome, Simon bar Giora made the tower his place of residence. Following the destruction of Jerusalem by the Romans in 70 CE, the three towers were preserved as a testimony of the might of the fortifications overcome by the Roman legions, and the site served as barracks for the Roman troops. When the empire adopted Christianity as its favoured religion in the 4th century, a community of monks established itself in the citadel. It was during the Byzantine period that the remaining Herodian tower, and by extension the Citadel as a whole, acquired its alternative name—the Tower of David—after the Byzantines, mistakenly identifying the hill as Mount Zion, presumed it to be David's palace mentioned in 2 Samuel 5:11, 11:1-27, 16:22. After the Arab conquest of Jerusalem in 638, the new Muslim rulers refurbished the citadel. This powerful structure withstood the assault of the Crusaders in 1099, and surrendered only when its defenders were guaranteed safe passage out of the city. During the Crusader period, thousands of pilgrims undertook the pilgrimage to Jerusalem by way of the port at Jaffa. To protect pilgrims from the menace of highway robbers, the Crusaders built a tower surrounded by a moat atop the citadel, and posted lookouts to guard the road to Jaffa. [dubious – discuss] The citadel also protected the newly erected palace of the Crusader kings of Jerusalem, located immediately south of the citadel. In 1310 the citadel was rebuilt by Mamluk sultan Al-Nasir Muhammad ibn Qalawun, who gave it much of its present shape. The citadel was expanded between 1537 and 1541 by the Ottoman sultan Suleiman the Magnificent, whose architects designed a large entrance, behind which stood a cannon emplacement. [dubious – discuss] For 400 years, the citadel served as a garrison for Turkish troops. The Ottomans also installed a mosque near the southwest corner of the citadel commonly known as the Mehrab e Qala'a e Daood (Prayer niche of Tower of David), erecting a minaret during the years 1635-1655. In the 19th century the conspicuous minaret, which still stands today, took over the title of "Tower of David", so that the name can now refer to either the whole Citadel or the minaret alone. During World War I, British forces under General Edmund Allenby captured Jerusalem. General Allenby formally proclaimed the event standing on a platform outside the eastern gate to the citadel. During the period of the British Mandate (1917–1948), the High Commissioner established the Pro-Jerusalem Society to protect the city's cultural heritage. This organization cleaned and renovated the citadel and reopened it to the public as a venue for concerts, benefit events and exhibitions by local artists. In the 1930s, a museum of Palestinian folklore was opened in the citadel, displaying traditional crafts and clothing. Following the 1948 Arab–Israeli War, the Arab Legion captured Jerusalem and converted the citadel back to its historical role as a military position, as it commanded a dominant view across the armistice line into Jewish Jerusalem. With the Israeli victory of 1967 after the Six-Day War, the citadel's cultural role was revived. A Dale Chihuly chandelier hangs in the entrance hall of the Tower of David Museum. 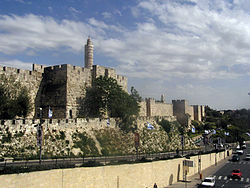 The Tower of David Museum of the History of Jerusalem was opened in 1989 by the Jerusalem Foundation. Located in a series of chambers in the original citadel, the museum includes a courtyard which contains archeological ruins dating back 2,700 years. The exhibits depict 4,000 years of Jerusalem's history, from its beginnings as a Canaanite city to modern times. Using maps, videotapes, holograms, drawings and models, the exhibit rooms each depict Jerusalem under its various rulers. Visitors may also ascend to the ramparts, which command a 360-degree view of the Old City and New City of Jerusalem. As of 2002, the Jerusalem Foundation reported that over 3.5 million visitors had toured the museum. In 2010, a survey of the site was conducted by Yehudah Rapuano on behalf of the Israel Antiquities Authority (IAA). ^ a b Dan Bahat (2007). "Jerusalem Between the Hasmoneans and Herod the Great". In Arav, Rami (ed.). Cities Through the Looking Glass: Esays on the History and Archaeology of Biblical Urbanism. Eisenbraunds. pp. 122–124. ISBN 978-1575061429. ^ Jerome Murphy-O'Connor, The Holy Land, 22. ^ Broad Wall - Jerusalem 101; see maps. ^ Jerusalem: an archaeological biography, Hershel Shanks,Random House, 1995, p. 80. ^ Jewish Quarter Excavations in the Old City of Jerusalem: The finds from areas A, W and X-2 : final report Volume 2 of Jewish Quarter Excavations in the Old City of Jerusalem: Conducted by Nahman Avigad, 1969-1982, Nahman Avigad, Hillel Geva, Israel Exploration Society, 2000. ^ Hillel Geva (1981). "The 'Tower of David'—Phasael or Hippicus?". Israel Exploration Journal. Israel Exploration Society. 31 (1/2): 57–65. JSTOR 27925783. While biblical scholar Robinson and archaeologist Geva proposed that the tower known as Hippicus be identified with the "Tower of David," this proposal was not accepted by archaeologists J. Fergusson, Thomas Lewin, Schick, G.A. Smith, C. Warren and C.R. Conder, who held that the tower of Phasael should be identified with the "Tower of David," based on its size. Wikimedia Commons has media related to Tower of David. This page was last edited on 2 April 2019, at 06:20 (UTC).